Those who have read Loren Coleman's initial and groundbreaking chapter in his Mysterious America (initially published in 1983; updated & revised edition in 2007) and the 1991 newspaper article Take Away Kidnapping Clowns by folklorist Jan H. Brunvand (Brunvand's interest was triggered by Coleman's pioneering research. Writes Brunvand: "Mysterious America... gives a good account of the 1981 phantom clown scares") and appended this with some Googling, would have had even more information than in Radford's sorry resume. Brunvand, who Radford eagerly cites, has not been contacted by Radford. Neither was Coleman. So, the two major authorities in this field have not been consulted. Radford therefore misses some major flaps that in themselves form an interesting geographical pattern of distribution (in his newspaper article, Brunvand gives a complete list till 1991, in the revised edition, Coleman cites a flap in 2000 in Fitchburg, Wisconsin, and I uncovered a flap in 1994 originating in Washington D.C. spilling over to Pasadena). Moreover, Radford misses the point completely. While clearly not having a single clue as to what the underlying stimulus might be for these phantom clown flaps, we are left with the usual babble about 'moral panics' according to Radford coinciding with the rise of 'satanic ritual abuse'. Writes Radford: '...it was precisely a time when a moral panic gripped America.' Oh, was it? Those of us who delve into digital newspaper archives know that hardly a year goes by without one or many more 'moral panics' distributed all over the U.S. and other countries. And in many cases, the stimuli for these panics are not the stuff of urban legend, although that they may become by oral tranmission, but have, at their hearts very real events. Unfortunately, as most proponents of moral panics hardly delve deep enough in the background, the true causes are often left untouched and undiscovered. Take for instance the serial killer in lovers lane motif. There are literally dozens of cases that shocked the nation (I will limit myself here to the USA) involving the slayings of couples or lovers on, you guessed it, lovers lanes. Some particularly gruesome examples are to be found in the lipstick and 3X killers of the 1930's, all the way to the infamous Zodiac killer. What this did with the human psyche, or the group mind, is perhaps best illustrated with the way these moral panics take shape. It is in the symbology of these oral transmissions, that we might at least get a clue as to the impact that these events had. Not so with Radford. Radford does not even take into account that 1981 was the year that the Atlanta child murders (itself a source for many strange urban legendry, I refer here for instance to the 'Atlanta Iceman' rumours) apparently, allegedly came to a conclusion. And yes, there was this John Wayne Gacy. And yes, there were serial killers driving around in cars, in vans, cluttering the landscape with their grisly signatures. But no, demonstrating that Radford did not even read his sources very well, it is suspected that he only read internet excerpts of Coleman's book. For instance, Radford once again (already Coleman treated this in detail and dismissed it) drags in Stephen King's It, failing to mention that the book came out in 1986, 5 years after the first phantom clown flap, and fours years after Coleman's first examinations of the separated, isolated Phantom Clown sightings (which never became national news). Moreover, in the same line Radford refers to the film Killer Clowns From Outer Space, in a feeble attempt to find yet another possible influence, but failing to mention that the film was released in 1988 - 7 years after the first Phantom Clown flap. Radford also did not Google very well, or he would have stumbled upon the phantom clown flap of Oude Pekela in the Netherlands, which happened in 1987. Like I commented in the past, this is a global phenomenon, whether it be 'moral panic'or something more sinister. Also, it would be interesting to find out how a - in 1987 at least - relatively unknown phenomenon or scare or urban legend that did not even make national headlines in the USA, could have transported itself to a little, sleepy village with only 8,000 inhabitants in the Netherlands. What irritates me therefore, is the snug tone with which Radford seemingly neatly tidies all up, and, in good fashion, dismisses all as urban legend. Another example of his discriminating use of his rather scarce source materials: when citing the phantom clown flap in Honduras, 1995, Radford treats the account lighthearted and ends his article with the obvious (and so tried and tested formula that it escapes me how this escaped the FT editor) vague pronouncement that "it seems unlikely that the world has seen the last of them..' A statement that is as non-conclusive and ultimately non-committal in nature as one can possibly be. But what did Radford leave out in order to lighten up his otherwise forgettable endeavour? The 1995 flap was widely reported in the US newspapers. Honduras police admitted in that same article that Radford only partly refers to: "the average of a child a day has been stolen in the last month and that some 300 have been taken, for unknown reasons, since 1993." So, whether there are phantom clowns or not, whether it is all 'moral panic' or not, there seems to be a real stimulus here at work, and that is at the base of these Honduras tales. Radford did not only fail to ponder upon this question no matter how brief, he also failed to provide the necessary narrative structure where exactly these important thoughts can be raised. After all, one should be very careful with the explanation of 'moral panic', if one is incapable of looking at what the precise causes of such an outbreak might be. Otherwise one fares no better than a 13th century quack who had his own mumbo-jumbo to choose from, sounding impressive, but really obfuscating his lack of knowledge. Oh, and by the way, in his 1991 article, even Brunvand wonders about what may have caused it all and writes puzzled that even if the phantom clowns are a variant of much older legends (the Pied Piper of Hamelin - as initially noted by Coleman - or the legends of gypsies stealing children): "How such ancient legends can keep recurring in the form of scare stories told by American youngsters is hard to explain." I have been a long time resident of the Atlanta metro area and I don't believe I have ever heard of the "Atlanta Iceman." Could you pint me to some information on this cultural boogie man? As I recall, Poltergeist was released in 1982 and fetaured a scary clown doll scene in the children's room, so the idea that the bad clowns will get you had obviously already reached Hollywood by then, which ties in very well with your timelines. Loren Coleman is your expert? The same guy who supported the reality of the proven fake Cottingley fairies? The same guy who runs a blog weighed down with clickthru advertising, about cryptozoology but in reality focuses only on Bigfoot, which survives by presenting every hair-brained rumour & unsupported speculation that comes along? Please come up with a better 'expert'. Very interesting blog re Phantom Clowns, do you have more info on the flaps in the Netherlands and Honduras? I'm coming up dry doing Google searches. In re to the previous poster, unless I'm missing something, Loren Coleman never supported the Cottingly Fairy photos as being genuine, so I'm not sure where you got that, and he has done much more to advance study in the field than most researchers still alive today, so lets give credit where credit is due and leave the badmouthing for the Biscardis and Beckjords of the world. I just happen to have my Evil Clown file out and can give you some citations. The Independent (London) reports child-snatching clowns in Honduras on Nov. 5, 1995 and there's a small article in The News-Frederick MD (Nov. 2, 1995). There were also panics in Guatamala and Mexico at the same time (New Statesman & Society: 12/8/95. V.8, issue 382, p.39). Also, try googling "clowns" and "Oude Pekela" for information about the Netherlands. I agree with mabuse. I do not enjoy the use of the word "expert" with anyone. However, I am NOT pleased with misinformation being spread about me because I collaborate, contribute, and coauthor. In 1975, Jerome Clark and I experimented with our thoughts regarding the overlap between Jungian psychology and various forms of unexplained phenomena then being discussed. The result was a book entitled The Unidentified (NY: Warner Books, 1975). Within that book, my coauthor wrote a chapter on fairies in which the Cottingley Fairies were referenced favorably. Writing a book with someone is always a compromise of positions, and several statements such as they "resemble nothing so much as paper cutouts" were my additions in that otherwise Clark-written chapter. But I "wrote" the book with Clark, take the heat as well as the praise, and so I understand why someone would think I backed the Cottingley Fairies. If you read the book, however, closely, you will find Clark is talking more about the experience than the photos. Clark and Coleman quickly rejected the Jungian stance and things like the Cottingley hoax (which was unmasked in 1982). In several writings since then, Clark has discussed the Cottingley hoax. In our recent re-issue of The Unidentified (NY: Anomalist Books, 2006), he settled the issue when he used the word "preposterous" in the introduction. As to complaints about Cryptomundo, again, the comment maker is confused. I am a blogger, a contributor there, and not the one that "runs" it. What people do to keep their free sites alive, via ads, may be disagreeable to people, but then they can make choices about going to watch television or seeing a movie, I guess, which have ads around the edges too. Cryptomundo has always been more than just about Bigfoot. In recent weeks, for example, I posted items on mermaids, a possible new mammal, mountain lions, Mothman, and more. To each their own, but as to phantom clowns, while no expert, I coined the term, studied the subject for a quarter of a century, and do have a degree in psychiatric social work with a specific concentration in child welfare. I was surprised to see that this magazine had turned to a skeptic, once again, instead of Fortean, to write such a piece. 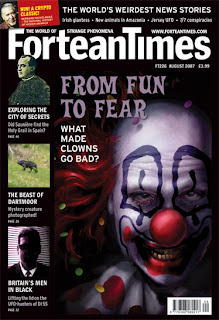 As far as the author of the Fortean Times article, his level of scholarship on this matter was sorely lacking, with regard to bringing in Stephen King's It into this matter once again.